Most folks who visit Colorado National Monument view its red sandstone landmarks from Rim Rock Drive and its many overlooks. It’s convenient for peering deep into the canyons. 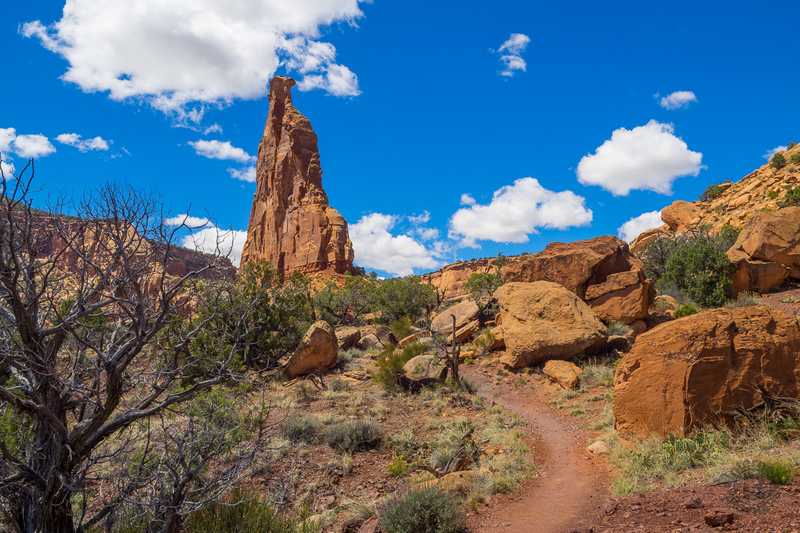 However, like most places of interest, getting out of your car and putting your boots on the trail will give you an up-close-and-personal encounter with iconic features like Independence Monument, the Saddlehorn, Pipe Organ, and the Kissing Couple. This 5-mile loop up Wedding Canyon, then back down Monument Canyon is a good introduction to ground level Colorado National Monument. I drove to Colorado and met my brother Dave for a two week vacation. This was our first stop, hiking it on Monday, April 27, 2015 from 9:30AM to 2:00PM. Our plan was to take the Wedding Canyon Trail to Independence Monument, explore Monument Canyon for awhile, then return via Monument Canyon Trail. Hike Rating: Moderate climbing up Wedding Canyon. Limited rock scrambling. Trail Condition: Good. Red dust and slickrock lined with juniper. 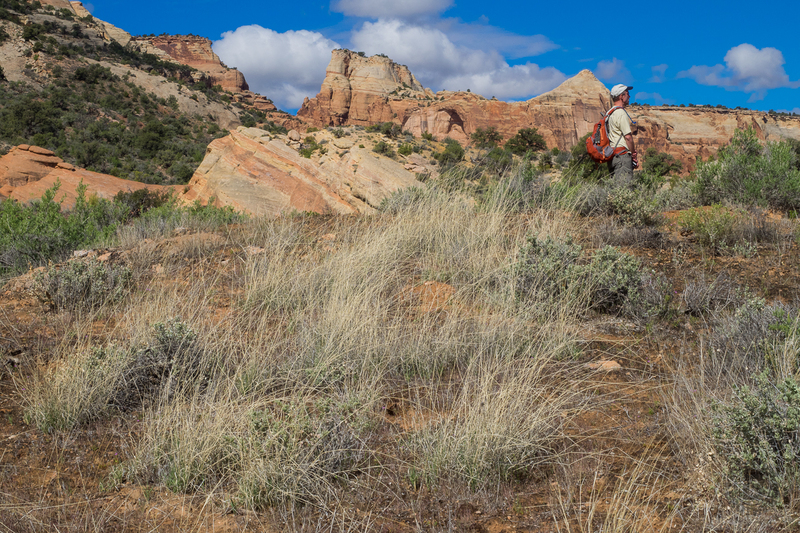 Starting Point: Lower Monument Canyon Trailhead on Broadway (Hwy 340) southeast of Fruita. Trail Traffic: We encountered two dozen others on this delightful Spring Monday. How to Get There: Take exit 19 off I-70 near Fruita, CO and head south on Broadway (Hwy 340) for three miles. Pass the entrance to Colorado National Monument, and continue 2.1 more miles on Broadway. Turn right on a dirt road for Lower Monument Canyon Trailhead. It may seem like you’re turning into a housing development, but the trailhead parking area will soon appear. Colorado National Monument preserves one of the grand landscapes of the American West. Bold and brilliantly colored, this mesa and canyon destination encompasses 32 square miles near Fruita, Colorado. This is a special place, one protected by John Otto and others with the foresight to create and plan the national monument. You can contemplate glorious, towering masses of red sandstone and views that stretch to distant horizons from Rim Rock Drive; or delve into the remote canyons on foot where you can delight in wild country where desert bighorns roam, golden eagles soar, and flowering cactus tickle the senses. Inside the park, the Visitor Center has information, exhibits, audiovisual programs, and a bookstore with maps and other publications. Rangers are on hand to answer your questions and help plan your visit. Rim Rock Drive offers 23 miles of breathtaking views. The road climbs from the Colorado River valley to the park’s high country, then winds along the mesa rim. Whether in your car, or on a bike, stop at the roadside overlooks along the way to enjoy the panoramas of the park’s great sandstone sculptures, canyons, and distant views. For our adventure though, we bypassed the main national monument entrance station and headed to the Lower Monument Canyon trailhead on Hwy 340. There is a gravel parking area with room for probably 15 cars. I would recommend getting there fairly early to ensure you have a parking place, as this trailhead is quite popular even on week days. The trail starts out in a southerly direction and soon offers you a choice. You can continue straight ahead on Monument Canyon Trail, or do as we did and take a right turn (west) onto Wedding Canyon Trail. The sign indicates that Wedding Canyon is “unimproved” trail, but we found it to be at least as well maintained as Monument Canyon Trail. I recommend you give it a go. Wedding Canyon Trail follows the national monument boundary for awhile, and you may notice some of Fruita’s high dollar homes just on the other side of the fence. What you are more likely to notice, however, is the delightful sights and smells of the juniper and pinyon pine that lines the trail. We also happened to be hiking here right as Spring was announcing its annual appearance with bright blooming desert wildflowers. Here, along the Wedding Canyon Trail, my brother Dave surveys the town of Fruita in the Colorado River valley below. Directly behind him is The Saddlehorn, the first of the sandstone landmarks you will see along the cliffs that overlook the canyon. At about the half mile mark the trail makes a turn to the southwest and begins its gradual ascent into Wedding Canyon. This is a wide canyon surrounded on either side by massive sandstone cliffs. You will climb a total of just over 600 feet, but unless you’re here in the dog days of summer, you may not even break a sweat. We found barrel cactus in bloom and plenty of prickly pear that looked to be perhaps another week from flowering. Keep that in mind when you plan the timing of your visit. We kept our eyes peeled for bighorn sheep who like to roam the ledges around the canyon. No luck on this day, but we have seen them within the national monument on previous visits. When we topped the rise, we had our first view of the sandstone monuments that erupt from the canyon floor, including Pipe Organ and Independence. We encountered a young family coming the other way, the only other hikers we saw on the Wedding Canyon side of the loop. Two and a half miles from the trailhead we reached a major trail junction and the base of 450-foot Independence Monument. There was a very large, flat-topped boulder there that made a perfect table for lunch. Four trails, from each compass direction, come together here. You can climb about a hundred feet up the base of Independence Monument, or you can go north on the Monument Canyon Trail, or you can go east on the Monument Canyon Trail. This is also where the Wedding Canyon Trail terminates. After renourishing, we took the east fork of the Monument Canyon Trail to go check out The Kissing Couple, another of the major sandstone monoliths. It’s about a half mile to the base of the Kissing Couple. Be sure to look over your shoulder occasionally at Independence Monument as its appearance seems to change with every turn in the trail. You can continue on the east Monument Canyon Trail to Coke Ovens and beyond, even climbing up to Rim Rock Drive. But we had seen enough and were ready to complete our loop. So we returned the half mile to the junction at Independence Monument. This time we took the north fork of the Monument Canyon Trail to begin the descent back to the trailhead. The area was a lot busier now as we were encountering other hikers about every 10 minutes. The photo below was the view behind us soon after we cleared the junction. Soaring 450 feet above the canyon floor, Independence Monument is a free standing tower of soft, red sandstone, the signature formation of Colorado National Monument. When the sun shines on the sandstone as it was for our visit, the rock almost glows shades of red and orange. Combine that with the rich azure Colorado sky, a few puffy white clouds, and you can see where the state gets its name. In addition to all the hikers who were now appearing, we also began to see lots and lots of lizards of all sizes and colors. The afternoon sunshine enticed them to come out of hiding. Most intriguing among them was a green and orange collared lizard with a tail at least 8″ long and a total length of more than a foot. To me, the Monument Canyon side of this loop isn’t nearly as scenic as the Wedding Canyon side. Sure, there is still plenty to look at like Mushroom Rock, but there is less foliage and the vistas are hidden by cliffs. Also, the last three quarters mile is back along the boundary fence looking into the backyards of the privileged residents. Still, it was great to be out west again, especially seeing my brother for the first time in six months. If you go to Colorado National Monument, you should definitely cruise Rim Rock Drive and check out all the overlooks. It’s great for photography, especially early morning and late afternoon. But, once you’ve done the touristy thing, make sure to get out on some of the trails too. This loop hike is a perfect example of what you can expect. It’s a great four season hike. The red rocks of Colorado National Monument are simply stunning with a fresh coating of Winter snow. If you go in Spring like we did, you will get to enjoy the desert wildflowers and cooler temperatures. Fall brings out different colors, mainly in the scrub oak found on the rim. You may want to avoid the worst of the summer heat because it can get above 100°. Whenever you go, be sure to take plenty of water. This canyon loop is family friendly, although you might want to leave toddlers behind. Kids over 5-6 should be fine. Even the grey beards and round bellies will probably enjoy it too. Whenever my brother and I travel from his home in Colorado to the canyon country in Utah, we always make a stop at Colorado National Monument along the way. I highly recommend it.